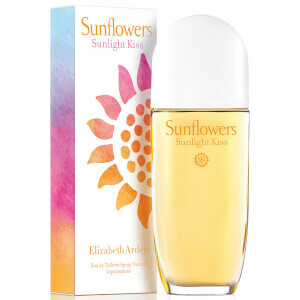 Elizabeth Arden’s Sunflowers Sunlight Kiss Eau de Toilette perfectly captures summertime in a bottle, overflowing with warm, effervescent notes and the essence of fresh blooms. Inspired by an undulating field of sunflowers swaying in the sun, the perfume evokes the sensation of a ripe summers day, opening with radiant accords of Italian Bergamot, Sparkling Mandarin and fresh Apple Leaves. A delicate floral heart of Rose, Jasmine and Osmanthus Cyclamen settles upon a base of heady Driftwood and Solar Musk for a soft, moreish scent. Top Notes: Italian Bergamot, Sparkling Mandarin, Juicy Loquat, Apple Leaves. Mid Notes: Osmanthus Cyclamen, Ozone Accord, Rose, Jasmine. Base Notes: Driftwood, Solar Musk.